Re-printed unedited by exclusive permission of CAR magazine. This article originally appeared in their issue for September 1973. NOT LONG AGO, SOME succinct soul observed that by the time British Leyland realised buyers were neglecting the MGB because it was gutless and outdated, and not because interest was declining in the sports car market as a whole, it might be too late to save either the marque or the market. The nostalgia value of the MG name had better be strong enough to maintain its position as the Abingdon saviour, for the marque is not going to be greatly helped by the 1973 offering of V8 power in the GT shell. All the V8 manages to do for the B is amplify its very long teeth. You get out of the car feeling only frustration for what might have-and should have-been. Perhaps we have all been naive by expecting too much, but it's still hard to believe that BLMC have done nothing to make it look like an MGB V8 other than tacking badges stolen from the Rover V8 onto the grille, flanks and tailgate, and bolting alloy-centred wheels onto the hubs. British Leyland have, of course, performed the transplant on the MGB at minimal cost and fuss. Perhaps as a reaction against the MGC, they decided not to put a power-hump in the bonnet to accommodate the V8 engine (from the C they certainly learnt not to call the car anything but a B). Instead, the engineers designed a new manifolding system that drops the twin SU carburettors to a low position at the rear of the heads. This gives a most unorthodox, almost Vintage, under-bonnet appearance; twin air filters sprouting lobster claws reach forward to pick up hot air from the exhaust manifolds (bimetallic valves in their tips switch over to cold air pickup in warm weather). Apart from an AC Delco alternator and free-flow exhaust systems, a bigger radiator cooled by twin electric fans and an oil cooler, the V8 is identical with the Rover TT5 unit. It develops 137bhp at 5000rpm with 1931b/ft of torque at 2900rpm from its 3528cc; compression is 8.25 to one. The gearbox mated to the V8 is a C-type unit, modified in detail: its casing has been redesigned to take a larger clutch and the intermediate ratios have been changed to more suitably match the torque curve of the V8. The electric overdrive, which is standard, works only on top gear. The final drive ratio has been dropped from the four-cylinder B's 3.91 to one, to a long-legged 3.07 to one. Having nutted-out its bonnet- saving inlet manifolding, BLMC had only to change the bulkhead, very slightly modify the inner wheel arches to get clearance for the exhaust manifolds and alter the front cross-member to make room for the pile of ancillaries that go with the V8. It is the array of ancillaries that creates an interesting point about the MGB V8 - the engine itself weighs 40lb less than the ancient 1.8 litre four, but the extra equipment that must go with the V-form takes its total weight to a little more than the four. This upsets the B's front-to-rear weight balance slightly taking it from 47.8/52.2 to 49.4/50.6. Following the keep-it-cheap campaign (the entire project was wrapped up for a mere £200,000) only absolutely vital changes have been made to the way-back-when suspension. The rear leaf springs have been stiffened to cope with the very much greater torque, the front coils are heavier to carry the extra weight now over them and the dampers-lever arm all-around, remember? - haven't been touched. The new wheels are from Dunlop, five-inch rims by 14 inches tall, made pretty by having cast-alloy centres and cheap by having chromed steel rims riveted onto them. (BLMC are careful to point out that the wheels passed strength tests with flying colours). As footwear you get 175HR-14 radials; in the test car's case, Goodyear Grand Rallies. There are no changes to the disc/drum brakes. And there are no changes to the body, either. Not even to the grille, which stays just the same criss-cross mesh that they gave us in the facelift late last year. 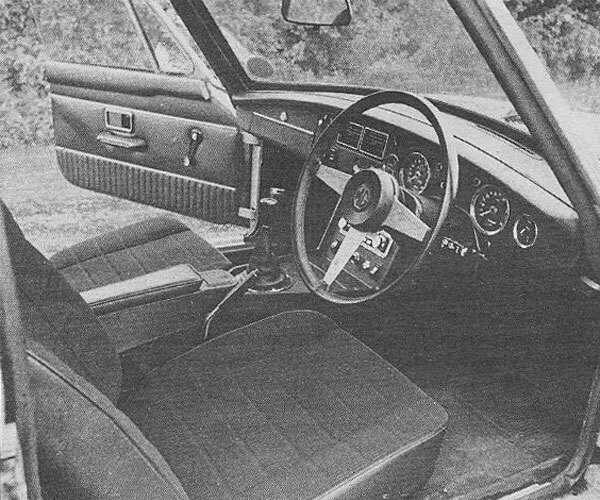 This issue of styling changes for the MGB V8 caused, we strongly suspect, more than a few ripples inside BLMC and MG. One of the MG styling men confessed to us that he and his colleagues had a bevy of nice little plans to really make the car look like 1973's MG. They would have at the same time, cured a few of the problems plaguing the B-GT, windnoise being the worst. Their plans were all knocked solidly on the head. Just drop in the engine, tack on the wheels and a couple of badges and be good boys, they were told. At the same time ideas of a drophead B GT were forgotten. Tests showed too much scuttle shake; the body just wasn't rigid enough without its steel roof. Customers might not always have been able to pick the deficiency, but the standards weren't high enough for them, say the engineers. Like the body, the interior is untouched, save for a smaller, leather-bound, steering wheel, and a speedo and a tachometer of 80mm diameter (in place of the more normal four-inch dials) for easier reading through the smaller wheel. You do get an outside mirror and tinted windows, but no radio as standard. Firing up the V8 brings that familiar smooth shrap' noise: strength and oomph, it says immediately you blip it, heaving the car slightly to the right with a healthy torque throw that seems strange in an MGB. The controls are light, which make the car pleasant to handle around the city. The clutch takes up positively as well as lightly, matching a quick, short-movement, gear change action. The car is deceptively quick - it will lope from 0 to 60mph in times of just over eight seconds and put down a standing quarter mile in 16.4 seconds if you kick it hard, but it doesn't feel very potent. It is smooth low down, certainly, although it does not give the impression of being really strong and torquey; brisk is the right word. Apart from second being too low, the gear ratios are well-suited to the V8. First to 39mph, second to 62, third to 97 and fourth to 122, Overdrive on the car we had was good for just a smidgin over 119mph - the 0.82 is just too high to allow the engine to pull out all its revs. This isn't purely a gearing problem. One of the car's most disappointing points is its lack of bite high up in the rev range. Once you get much past 4000rpm the engine feels quite weak, as if it's revving for the sake of revving and that's about all. Several times, when I wanted to overtake quickly I found I hadn't anything like the urge I wanted in top, dropped down to third and found that it wasn't much better. With this lack of urge high up there is little point running past 4500rpm, although the red line doesn't come until 5200rpm; the engine is still quite smooth up there in first and second - and third if you do care to persist with its use. What it boils down to is that this is a performance unit that is very good in many ways, but falls frustratingly short of being totally desirable. The good things are its ability to reach a high cruising speed quickly, and to hold it effortlessly: at 100mph in overdrive the tacho shows a moderate 3500rpm. There is also fairly good fuel consumption which makes it possible to achieve 20mpg at a 100mph cruise.  And another is windnoise. Because the engine is so quiet and the car tends to go faster more often, the serious aerodynamic deficiencies of the GT body become more apparent than before. At 85mph the windnoise is getting bad; at 100 it's loud; at 110 you may as well be standing in a hurricane - you're shouting; at 120 give up, you won't be heard anyway. The problem areas are the pillars and the sealing strips around the trailing edges of the front side windows. The door-mounted mirror contributes a lot of noise, too. Whatever happened to Frank Costin's aerodynamic outside mirror? The noise is in fact, abominable. It completely offsets the long, relaxed, touring ability of the engine and although I've been trying to think of a car that's worse for noise. I haven't succeeded. The stability problem lies both in the aerodynamics and the suspension. What happens is that at 100mph the car moves about as if it's being buffeted by a crosswind. It doesn't go a great distance across the road, but it's more than enough to annoy and worry a conscientious driver. It makes your wrists ache and you're battling at one end a distinctly unpleasant, nose-heavy, dead feeling, and at the other a tail that wants to stray around. The nose-heaviness is ever present, making the car feel much more like an MGC than it has any right to. It worries you most when you want to change direction - even so slightly as to correct those motorway wanderings - because the response to the steering input is slow. So, beset with this nose-heaviness the B V8 never feels a happy car. On bendy roads it is loathe to come cleanly and quickly onto the line you want; and the very quick 16.4 to one rack-and-pinion steering loads up as you lift it into the corner, so your wrists ache some more. In anger more than anything else you can reach for second and thump on the power to go around in oversteer - messy, and not even fun in this instance. Although the revised springing doesn't cope too well with the new weight distribution, it does look after the ride satisfactorily. It's firm, although not in the slightest bit uncomfortably, and there is very little body roll. Yet despite this quite respectable ride, the car really does feel old on the road. Add to that, the interior hits you with the same feeling: the confined, low-vision cabin with thick pillars; the dashboard that's near-as-dammit to the way it appeared in the first B roadster 10 years ago. I suppose it's functional and unobtrusive, but it's not up to the image of the car or £2300 1973 standards. The same applies to the instruments, which all reflect far too much. Where the car is pleasant is in the seats and in the layout of the driving position. The seats hold their occupants both comfortably and capably, and the driver sits with his arms at a pleasant distance from the wheel and gearlever. The tiny, fold-down, rear seat is really only capable of toting kids; better to drop it and use the space for luggage-something that the GT is well able to move in quantity after it's loaded via the swing-up rear door. Starting at the bottom, there's the Capri 3000GXL. With the works, sun-roof and all, it costs around £1900. With a 123mph top speed, the Capri just has an edge on the MG. It matches the V8 for acceleration too, and has at least as much sporting feel. The V6 is just as torquey on the road and is quite definitely more spritely than the 3.5, although to maintain cruising speeds matching those of the B the fuel consumption is worse because the V6 uses more revs per mile. As we pointed out in our Giant Test (August issue) the Capri is a sloppy handler, affected badly by bumpsteer and understeer. In the MG, too, you have to thump on the power to bring on oversteer. So both cars are about equal in their handling, although the Capri suffers from none of the B's high-speed instability and, lacking serious windnoise, is a better touring car. 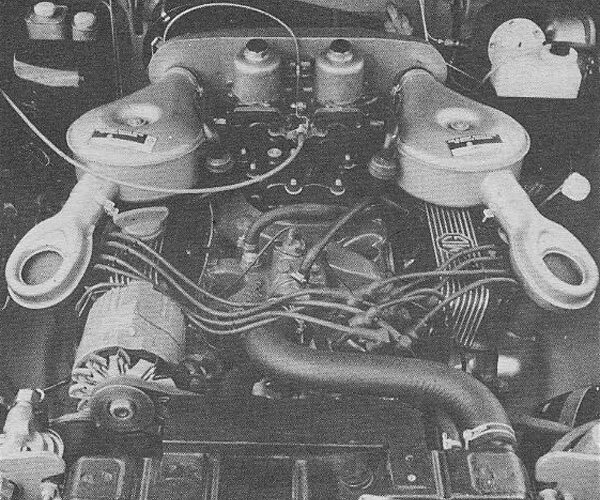 One of the advantages the B V8 offers over many of its opponents is that it is built by a major manufacturer, has a well-known engine and is easily serviced. But the Capri is built by an even bigger manufacturer and has an even more common engine. It is just as comfortable as the B, can seat two extra citizens with fewer problems, has a more appealing interior and a better equipment level... and a lower price. Despite the poor handling, there's no question which car is the better value for money. At £1931 there is the Jensen-Healey. In theory, if not in practice, you can have it with a hard-top, so it can be fairly considered an opponent for the MGB V8. It doesn't have the lugging power of the V8, but it does have a smooth, fuss-free, sporting engine that thrives on revs and puts up performance so close to the MG's that the difference doesn't really matter. It handles better, rides better, has a better interior and is more comfortable. For £2397 you can drive away in a Lancia Fulvia HF 1600 which is a honey of a coupe. It is not in the B's performance league, but find it a bendy road and its front-wheel-drive agility will leave the MG gasping. Has a five-speed box. Just two more pounds will buy a BMW 2002. Once again, way down in power and performance, but quiet, smooth and stable, and a fair enough handler, but lacking the easy cruising ability of the 3.5litre V8. For pure performance the TVR 3000M rears its stubby head at £2464, shading the B for acceleration, leaving it in the bends too, and is just as comfortable for two, but bear in mind the decided disadvantage of coming from a rather obscure family. Then at £2535 there is the Datsun 240Z. One of the best-looking coupes around, and known for its beautifully smooth and strong six-cylinder engine that can outrun the B by three mph and hold it firmly all the way in acceleration. It has a five-speed gearbox for both performance and relaxed touring, some steering vagueness and a little front-end float, but otherwise handling that allows the driver to enjoy himself, and a cockpit that is modern and impressive. Even though it costs £200 more, it is better value than the B. If you can bear to come down to half the number of cylinders, the Lotus Plus 2S is remarkable for having a top speed of just on 120mph, plus a 0-60mph time of 8.1 seconds. It's not a cheap car anymore, not at £2789, but the cost is easily justified by the sheer agility and finesse built into its dynamic qualities. Although performance is similar to the B V8's. it achieves it with revs more than torque, so some of what you pay for is the sophisticated suspension. Both up and down the price scale, the MGB GT V8 comes off quite badly. It's not a bad car: it's just not a very good one, and is a long way from being the answer to an MG fan's prayers. The most fitting comment lays in the adage: Better late than never. 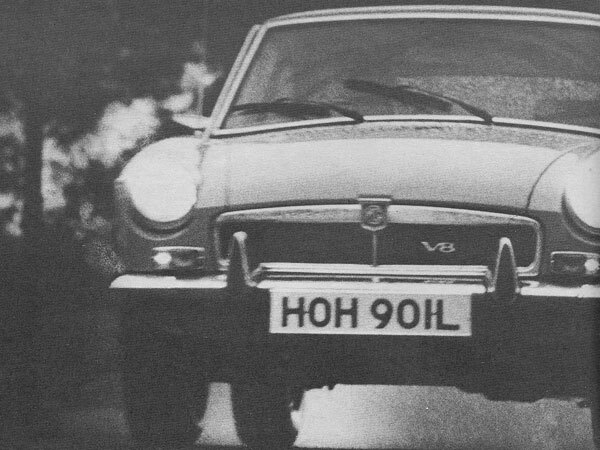 BritishV8 Magazine has assembled the largest, most authoritative collection of MG "MGB GT V8" information you'll find anywhere. Check it out! 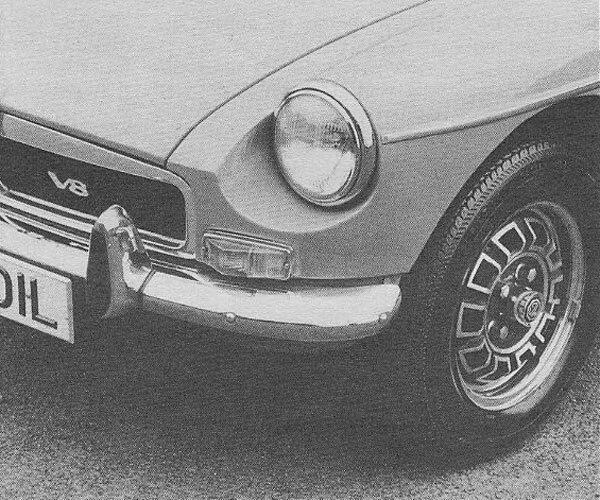 Access our MGB GT V8 article index by clicking here.